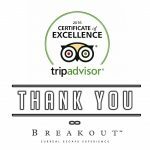 (Busan, South Korea) 23th June 2016– BREAKOUT, the No.1 Kuala Lumpur Malaysia Escape Room Game Operator recommended on TripAdvisor making its debut in Haeundae Beach, Busan after a successful opening of two outlets in Kuala Lumpur Malaysia and 1 outlet in Brossard Canada in 2015. Each Breakout’s theme room is designed to have its own storyline, mindboggling puzzle, tasks and stratagems that have to be completed within 45 minutes. Players will be locked inside each game room and they will start with different scenarios such as handcuffed, trapped or even caged based on the storyline. They will need to use their wits, skills and teamwork to solve the puzzles and breakout from the rooms using the clues given. Breakout, also the First Character Based Escape Room Game in the world will provide the customers the opportunity to experience escape room game with special abilities assumed by each player. The introduction of characters in real escape game enhances game play strategy among players, creating a more intense atmosphere where a twist on decision-making becomes a new and crucial part of the game. Each character comes with their own perks, and players are designated with an individual responsibility to help the team to Break-Out. Launching 5 escape theme rooms CHAMBER OF HOCUS, MR OSWALD’S GREATEST SHOW, MATERIA MEDICA, and TERRAFORM AND PROJECT FALLOUT, players is Busan now get to experience 5 different themes with different level of difficulty and a movie-like escape game with new innovations with a little bit of RPG or role-playing. Address: Crystal Beach Officetel 609, Jung 1-dong, Haeundae-gu, Busan, South Korea.